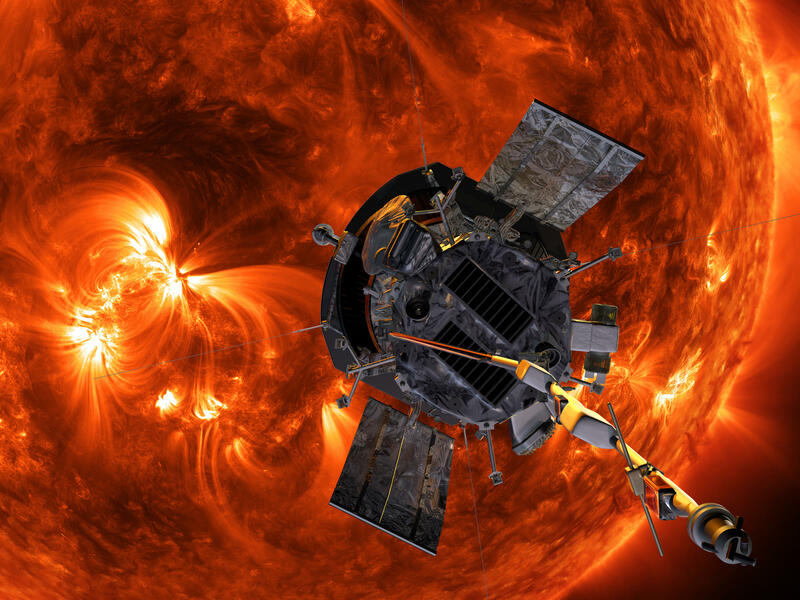 Artist's concept of the Parker Solar Probe spacecraft approaching the sun. Launching in 2018, Parker Solar Probe will provide new data on solar activity and make critical contributions to our ability to forecast major space-weather events that impact life on Earth. There's a lot about the sun that remains a mystery. NASA plans to send a probe into space Saturday that will get closer to the sun than ever before. NPR's Nell Greenfieldboyce reports it stands out in another way, too. NELL GREENFIELDBOYCE, BYLINE: This spacecraft is the first one that NASA has ever named after a living person. It's called the Parker probe. Ninety-one-year-old Eugene Parker learned of the honor when he got a call from the head of science at NASA. EUGENE PARKER: And he said, we have this idea about putting your name on it. Do you object? And I said, no, I guess not - rather flattering, in fact. 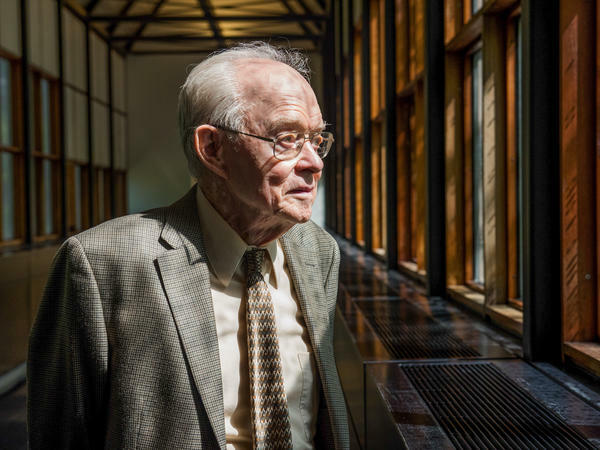 GREENFIELDBOYCE: Eugene Parker is a godlike figure among folks who study the sun. Sixty years ago, in 1958, he predicted that the sun was constantly spewing out a stream of charged particles at supersonic speeds. He called it the solar wind. Back then this seemed laughable. Everybody knew that space was empty. PARKER: Well, it's normal in the scientific world if you say something new and different that it will not be believed. So it was no surprise. And it was annoying, but no surprise. GREENFIELDBOYCE: One of his critics even suggested he should go to the library and read up on the sun before trying to write papers about it. PARKER: And (laughter) the question is, well, what do they think now? Well, they're all dead by now, so it doesn't really matter. GREENFIELDBOYCE: Because he was right about the solar wind. GREENFIELDBOYCE: NASA says that's the sound of it from data collected by the Voyager 1 probe. He was right about a lot of other stuff, too. You can open textbooks and read about the Parker spiral, the Parker equation, the Parker instability, the Parker limit. ANGELA OLINTO: In our field he's definitely a celebrity. GREENFIELDBOYCE: Angela Olinto is an astrophysicist at the University of Chicago, where Parker worked for decades. OLINTO: Most of science is done by a lot of small steps by a lot of different people. He's one of those few people that we know that have made big breakthroughs a few times. GREENFIELDBOYCE: I went to see the Parker Solar Probe before it got packed into the rocket. Project scientist Nicky Fox and I put on white protective suits and went into a big clean room. NICKY FOX: The Parker Solar Probe is the first mission to really journey into the sun's corona. So that's the atmosphere that we could all see on August 21 when we had a total solar eclipse. GREENFIELDBOYCE: During the eclipse, the blacked-out circle of the sun was surrounded by a ghostly white ring. That's where this probe is going. After traveling for seven years, it will come within 4 million miles of the sun's surface. It'll be going really fast. FOX: It'll be moving at about 430,000 miles an hour, which is about 118 miles a second. We will be the fastest thing ever by an awful lot. GREENFIELDBOYCE: The spacecraft looks like a two-story-high flashlight wrapped in silver foil. The end that will point towards the sun has a heat shield to protect the probe from temperatures as high as 2,500 degrees Fahrenheit. Mission system engineer Jim Kinnison says the heat shield is a 4 1/2-inch-thick layer of foam. JIM KINNISON: It kind of looks like the florist foam that you would use to make flower arrangements, very similar in feel and in texture. This, though, is pure carbon. GREENFIELDBOYCE: Behind this shield it'll be room temperature, and that's where the instruments are. Fox says their measurements will hopefully help explain the mystery of why the sun's atmosphere is super hot, 300 times hotter than the sun's surface. FOX: And that just shouldn't happen. It kind of defies the laws of nature. If you move away from a heat source, it should get cooler. But for us it actually gets hotter. GREENFIELDBOYCE: Figuring that one out is something Eugene Parker is looking forward to. PARKER: It'll be really fun to be able to close in on that problem eventually. GREENFIELDBOYCE: You know what else is fun? A rocket launch. PARKER: I have an invitation to go to the Cape and sit there close up and watch the thing go. It's my first rocket launch, so it'll be very interesting. GREENFIELDBOYCE: And it will be the first time the namesake of a NASA mission will get to see it blast off. Nell Greenfieldboyce, NPR News. Transcript provided by NPR, Copyright NPR.